Hotel Restaurant Reviews and Feedback Script is one of the necessity and emerging script for the restaurant owners and for the new entrepreneurs who like to start-up their business online without any technical knowledge about the site, nowadays the people are looking to order the online food items from their favorite food spotting restaurant by seeing the reviews and feedbacks ratings of the respective restaurant service, so this scriptplays the vital role to make decisionfor choosing the right Online Food Ordering restaurant, then our script can be customized as global or localized according to the user requirement. This Online Food Ordering and Delivery Script is designed with professional reviews and feedback site integrated with attractive restaurant website templates, then we have added unlimited categories and sub-categoriesfor the users to make easy submitting the feedback and reviews by clicking the required product, in our script the new visitor can simply sign-up the account with their mail id & password, then the user can able to clear view the top-rated hotels and total users, hotels and reviews count on middle of the home page to make robust for the users. In our PHP Restaurant Scripts the visitor can search for the restaurant by entering the location or name, cities, categories, and then can view the hotel profile with the images, descriptions, contact information, hotel experience, license information, available timings, reviews and ratings. The visitor can submit their feedback & ratings to the respective hotel. In the footer of the site we have most search hotel, most search category and most search city to make easy reliable access to the user. In our Open Source Restaurant Booking Script the user can register their company restaurant by submitting the license id &proof, the request are approved by the admin, and then they can receive the notification for the user ordersand reviews through mail, where the admin can manage the site by approving the user feedback request and company or restaurant request, he can able to view the entire details on the single dashboard. If it is necessity to change the logos, site title, names, add or delete categories, accepting or declining the user reviews and ratings. Our Hotel Restaurant Reviews and Feedback Script is facilitate with SEO-friendly URL and we follow Google guidelines to make the site optimization, upon the purchase time of the script it will be live in 48 hours and additionally we offer 6-months free update services and brand free site. 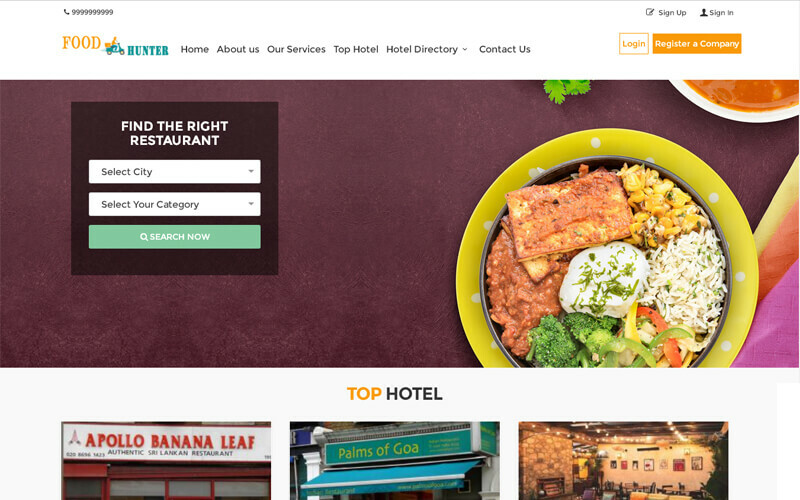 Hotel Restaurant list with clear details, Basic and Advanced Search options, Top Hotel Restaurant, Hotel Restaurant Booking, Appointments management, Location Management, Category Management, Hotel Restaurant Management, Review Management, Ad Management, User Feedback Management. I bought this script for past few month very appreciable features and its customization facility. Good job and reasonable prices. This is my 2nd script from phpscriptsmall. I was attracted by their involvement and recommend you to buy this script from this team. It is an efficient feedback script for my business. Just amazed with your works and handling requirements of a customer. Looking forward to keep your support.